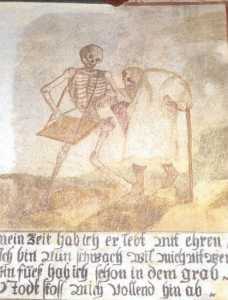 eath leads the old man by the hand towards the open grave. 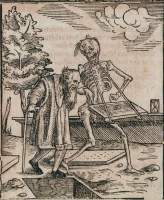 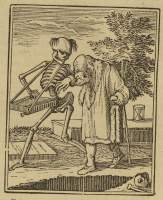 The man seems to show more interest in Death's dulcimer. 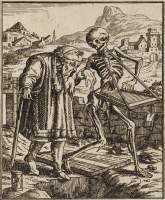 The hourglass stands at the end of the wall — time is left behind. 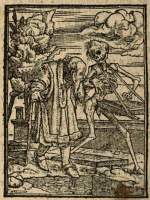 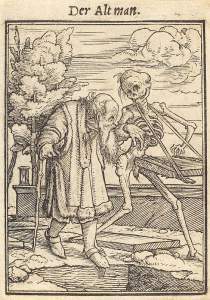 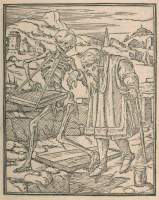 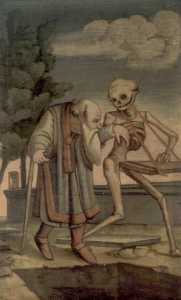 The picture is reminiscent of the hermit in Holbein's dance of death alphabet (picture to the right). 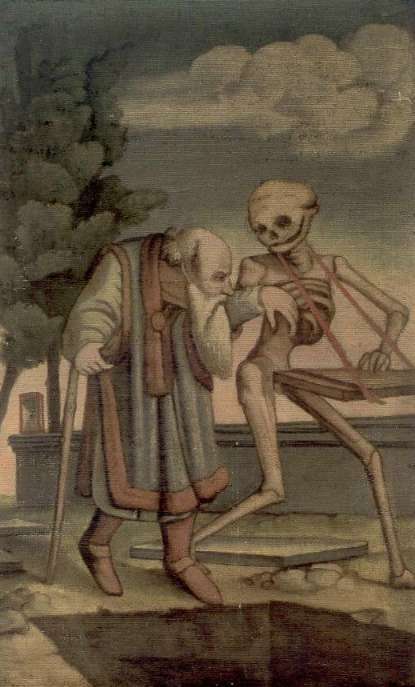 In both cases, Death leads an old, fragile man by the hand. 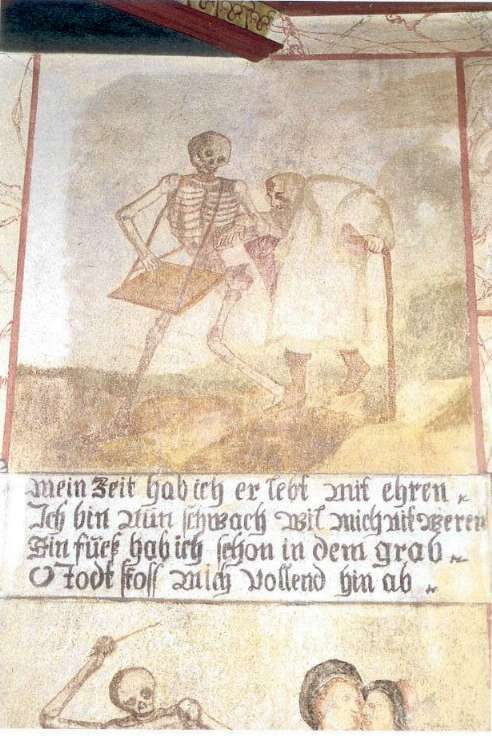 In one case, the hermit is about to stumble over a stone, in the other case the man will fall into the open grave. 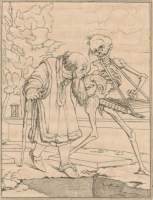 Holbein's woodcut has inspired the dance of death in the chapel in Haselbach (picture to the left) and the dance of death from the former ossuary in Wasserburg from 1837 (picture to the right). 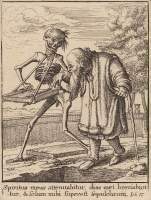 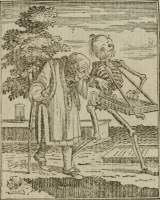 See also the blind man in Basel's dance of death. 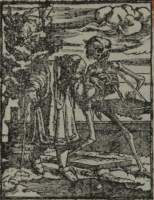 Variations: Birckmann has placed the hourglass next to the grave, removed the tree and added a village in the background. 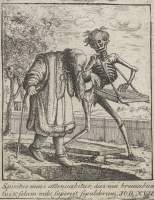 For once he's not imitated by Hollar and Deuchar. 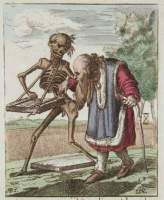 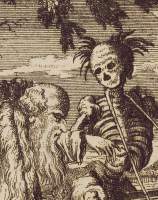 Bewick places the hourglass on a sarcophagus and spreads a few bones on the grounds.